February was another eventful month in the life of Instagram. The CEO and co-founder Kevin Systrom met with Pope Francis. He shared a list of 10 curated Instagram images with the Pope as they spoke about power of images to unite people across the world. Let’s see what this power of imagery results in growth and engagement for brands on the platform. Follower growth in February was at 0.2%. This is a 45.95% decrease compared to January. February had the lowest follower growth since we started doing our studies in April 2015. 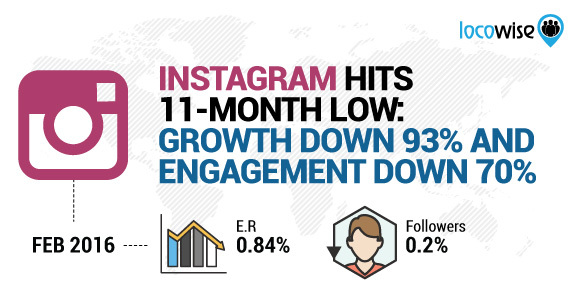 Follower growth on Instagram has declined by 92.86% in this time period. Instagram is still stronger than both Facebook and Twitter. Facebook had a page likes growth of 0.14% in February, while Twitter follower growth was 0.11%. Opportunities for large organic audience growth are pretty much non-existent on all three of the platforms. Instagram has announced that they now have more than 200,000 active advertisers. 75% of these are based outside of the US. The platform now sells ads in more than 200 countries around the world. This means that not only does Instagram beat Twitter in monthly active users (400 million v 320 million), but it also beats it in monthly active advertisers (200,000 v 130,000). There’s still a long way to go to in order to reach the parent company. Facebook has more than 3 million active advertisers. 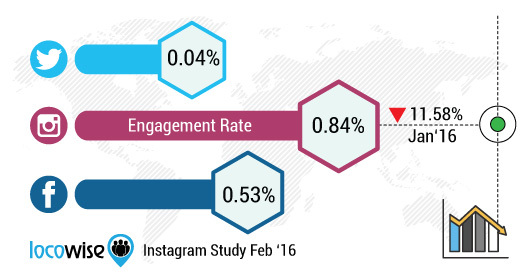 Instagram engagement rate in February was 0.84% of the total audience. This is a 11.58% decrease compared to January. It’s the lowest engagement rate since we started doing our studies 11 months ago. Instagram engagement has decreased by 70% in this period. 1. More brands and other users are getting onto the platform. They’re also posting more often. This creates a lot more noise. 2. Instagram has ramped up its advertising businesses over the last few months. This adds even more noise. 3. A typical Instagram user now follows more accounts. This means that there’s more content in their feed. It makes them miss out on a lot of stuff. “I fully expect that they will move to an algorithm at some point,” said Kenny Mitchell, head of consumer engagement at Gatorade, which has 743,000 followers on Instagram. “Because of the tremendous growth, having an algorithm can help with the utility of the platform, so you’re actually getting served things that are most useful to you,” said Gatorade’s Mitchell. It’s important to note that despite the decline Instagram is still a more engaging platform than Facebook and Twitter. Twitter’s average engagement was at 0.04% of total followers in February. Post engagement on Facebook was at 0.53% of all page likes. An Instagram post gets 2000% more engagement than a tweet! Images still rule Instagram. Images stood for 91.07% of all content posted in February. Images engaged 0.88% of the total audience while videos engaged 0.53%. You gain a 66.04% boost in engagement by posting an image rather than a video. Instagram is changing the way they display likes. Content with less than 11 likes used to display the usernames of people who liked it. The new test shows likes as a number even if the post has got less than 11 likes. This is in addition to the video view count that we reported last month. 1. Experiment with Instagram. Switch some of your focus from Twitter to Instagram. It’s still the platform to beat in terms of engagement. 2. Improve your imagery. Have your team come together for a brainstorming session. How can your images make a bigger impact? Can you think of an interesting concept for your Instagram profile? 3. Consider Instagram advertising to help you cut through the noise on the platform. It’s the best way to boost the size of your audience and the reach of your content.